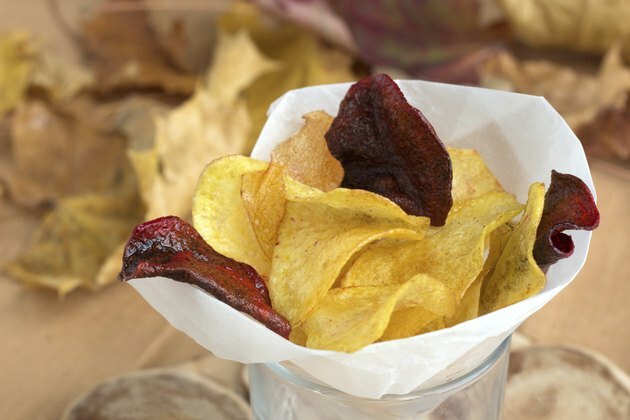 For many consumers, veggie chips are a dream-come-true. Crispy and salty like potato chips, but made from vegetables, veggie chips might seem like the perfect blend of taste and nutrition. Not so fast. Yes, veggie chips are made from real vegetables and potato chips are made from real potatoes, but that doesn't make them healthy. You'll get small amounts of key nutrients when you eat veggie chips, but you also need to consider the fat and sodium content of the snack before digging in. A 1-ounce serving of veggie chips contains 134 calories and 6.6 grams of fat, of which 0.5 gram is saturated. The low-saturated fat content is a plus because watching your intake of this kind of fat is a good way to protect the health of your heart. That same serving of veggie chips also supplies 1.5 grams of protein and 1.3 grams of fiber, which is about 7 percent of the at-least 20 grams of fiber you need each day. For comparison, one ounce of potato chips contains 154 calories and 10.3 grams of fat, of which 1.1 grams are saturated. One ounce of veggie chips supplies you with 1.37 milligrams of vitamin E, which is a nutrient that helps protect your cells from the kind of damage that can increase your risk of heart disease and cancer. This amount is 9 percent of the 15 milligrams of vitamin E you need each day. Veggie chips also supply small amounts of iron, potassium, vitamin C and vitamin K.
Though you do get certain nutritional benefits from eating veggie chips, you also get a significant amount of sodium. Just one ounce of veggie chips contains 101 milligrams of sodium. That doesn't sound like much, but it's about 4 percent of the 2,300 milligrams you should limit yourself to each day, as recommended by the University of Maryland Medical Center. If you're following a low-sodium diet, it's 7 percent of your daily 1,500-milligram limit. Keep in mind, too, that an ounce isn't very much, so it's easy to eat more and therefore consume far more sodium. For comparison, an ounce of potato chips contains 466 milligrams of sodium. In terms of fat and sodium, veggie chips are a better snack choice than potato chips. When you eat veggie chips, stick to a small handful since they do contain fat and sodium, even if it's in smaller doses than potato chips. You might also look for reduced-sodium versions to increase the nutritional value a bit more. Making your own veggie chips is another smart way to create a more nutritious snack. Drizzle olive oil over thinly sliced vegetables, such as sweet potatoes and carrots, sprinkle them with dried herbs and spices and roast them until they're crunchy. How Many Calories Are in a Cheeseburger?